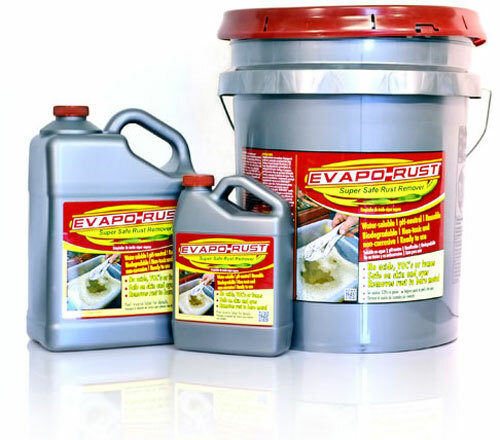 ICAFe Companies are now distributors of EVAPO-RUST from Harris International Laboratories, Inc. EVAPO-RUST is a water-based, non-toxic, environmentally safe rust remover. EVAPO-RUST will not harm metals, rubber, plastic, wood, glass, PVC, Viton, most paints, most chrome, or non-rusted steel. 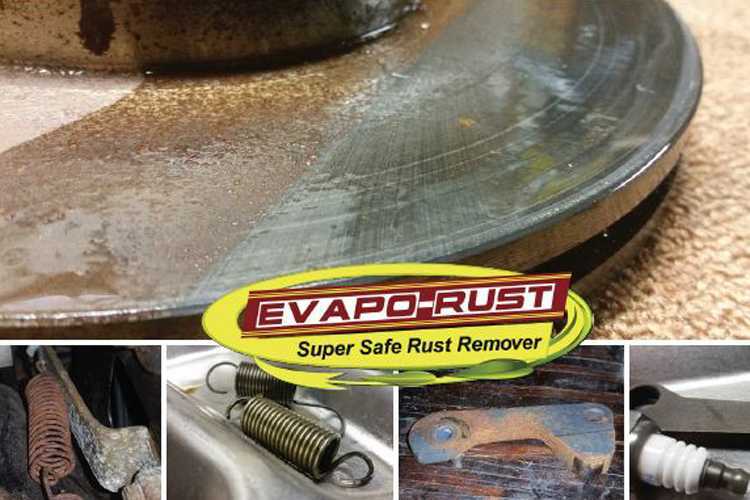 A single gallon of EVAPO-RUST can treat up to 300 pounds of moderately rusted steel parts. The product is biodegradable, and only the iron content will dictate the disposal method. Chelation is a type of bonding of molecules to metal ions. It involves the formation or presence of two or more coordinate bonds between a polydentate (multi-bonded) ligand and a central atom. These are generally organic compounds. You’re likely already familiar with chelating agents and their ability to transport iron. Hemoglobin in your blood transfers iron by chelation. Hemoglobin is composed of a protein matrix that holds four porphyrin rings called “Hemes”—Chelating agents that bind to iron. The EVAPO-RUST® chelating agent specifically binds with the iron in iron-oxide, but it is not strong enough to remove iron from steel. 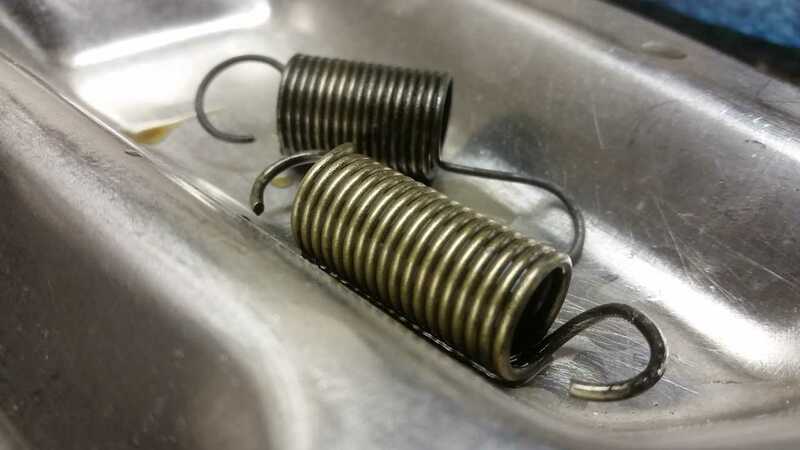 It will not react with any other common metals or metal oxides (copper, aluminum, nickel, etc.). 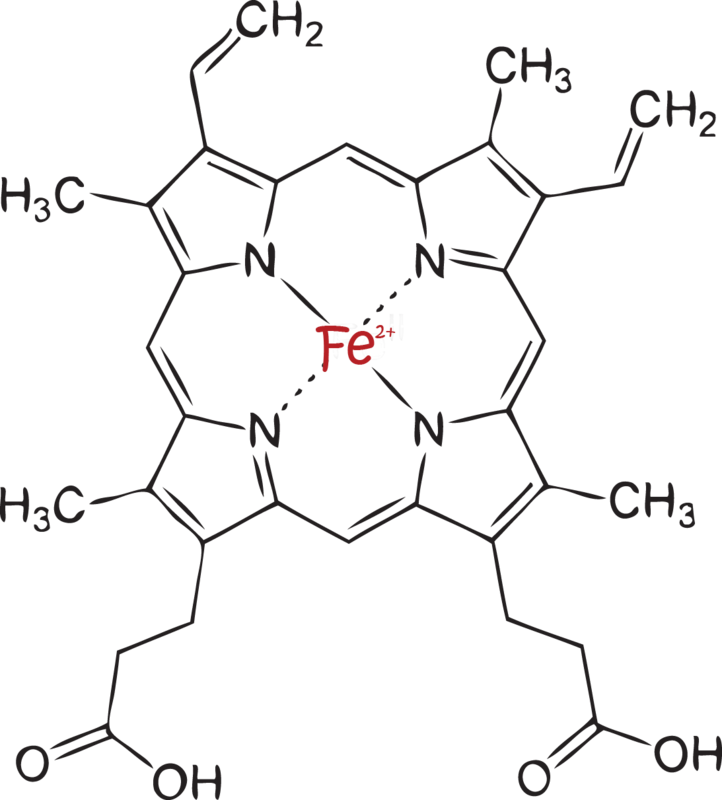 Heme B - A molecule found in hemoglobin that transports iron ions through the body much like the chelating agent in EVAPO-RUST® binds to the iron in rust to remove it from a substrate’s surface. Iron is extracted from iron oxide by selective chelation. 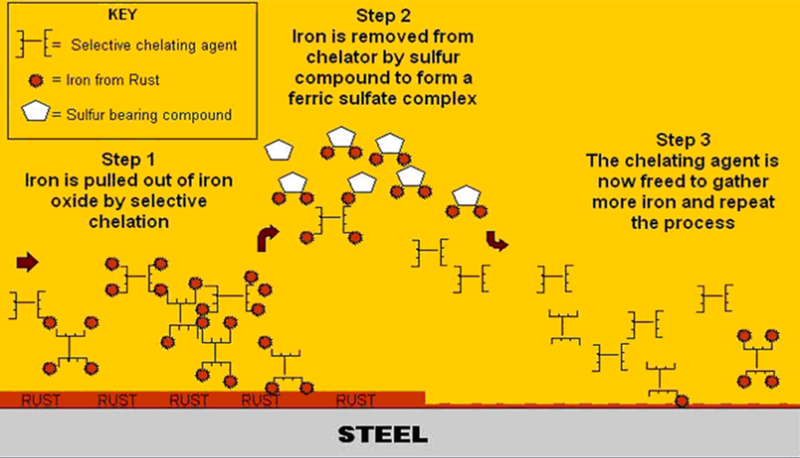 Iron is removed from the chelating agent by a sulfur compound to form a ferric sulfate complex that remains soluble. The chelating agent is now free to extract an additional iron from iron oxide, and the process continues with diminishing rate as the sulfur compounds are used up. 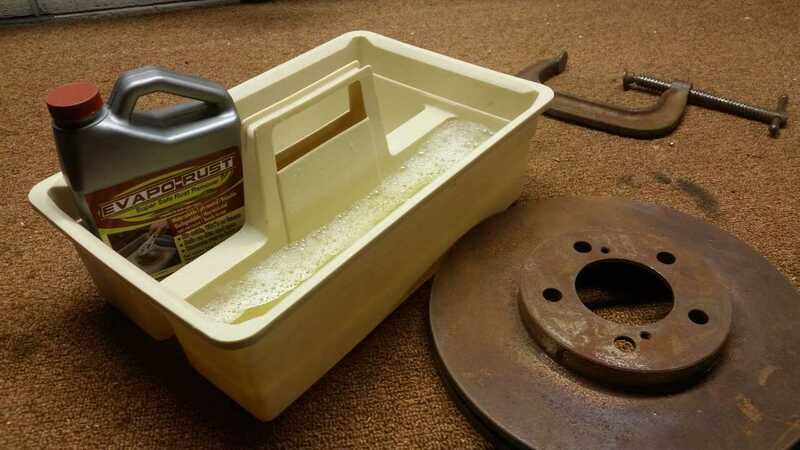 EVAPO-RUST® contains detergents to penetrate oils and dirt; however, surface contamination slows down the process and shortens its effective life. EVAPO-RUST® has an indefinite shelf life, but once it has been opened, it should be stored open to atmosphere in order to discourage anareobic bacteria because it is biodegradable. 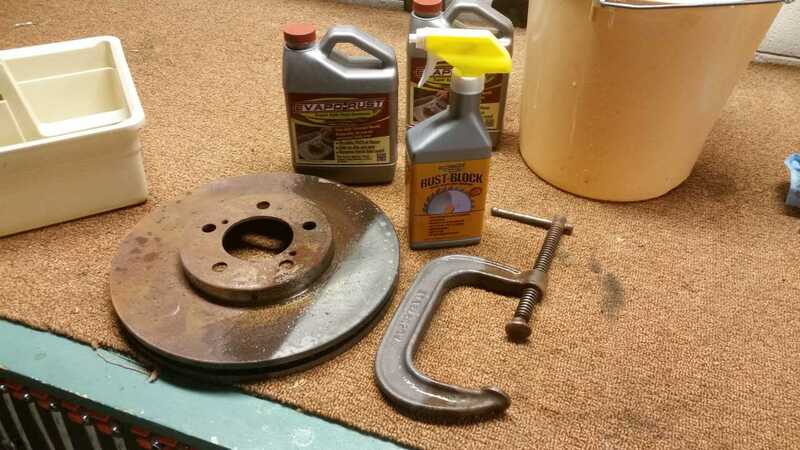 One gallon of EVAPO-RUST® will remove 1/2 pound of pure dry rust. This equates to approximately 300 pounds of moderately rusted steel. Can be purchased in 1 quart, 1 gallon, 3.5 gallon, 5 gallon, and 55 gallon drums. 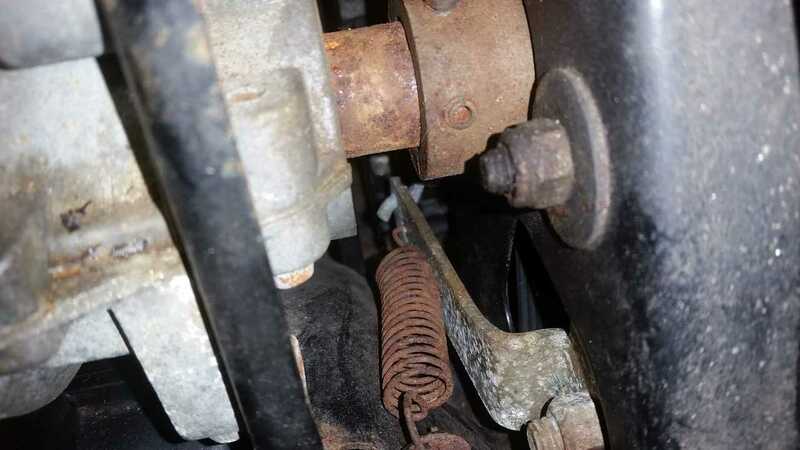 Ideal temperature is 120°F, but at room temperature parts with moderate rust can be de-rusted in as little as 30-60 minutes. 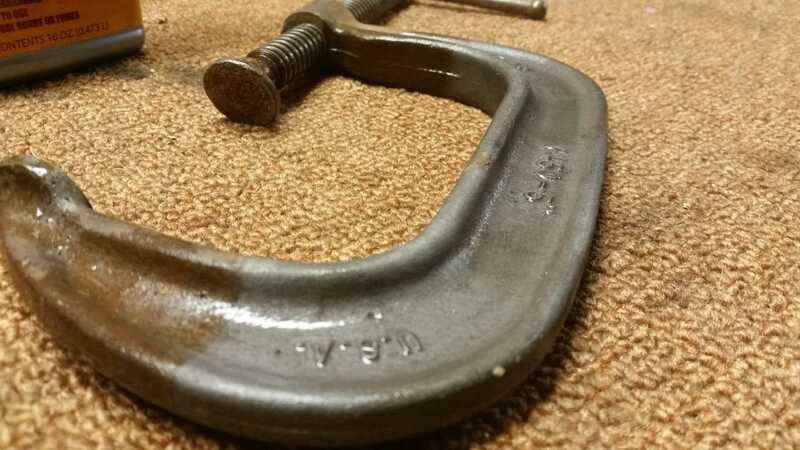 Heat and agitation significantly increase rate of rust removal. 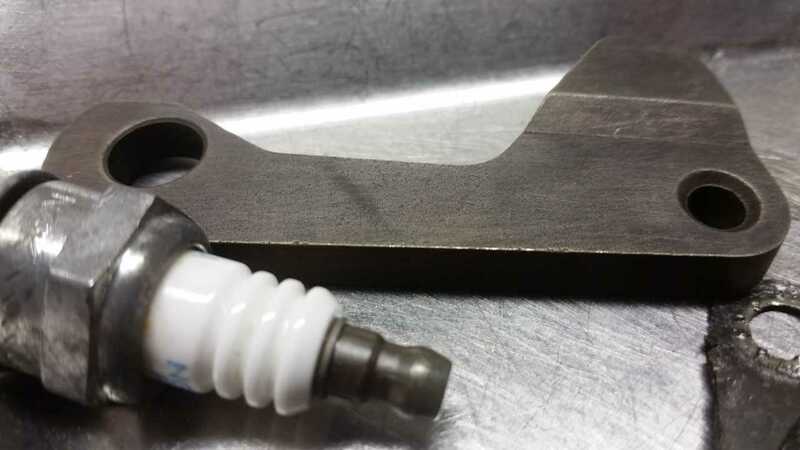 Ultrasonic can cut removal time by 75-80%. 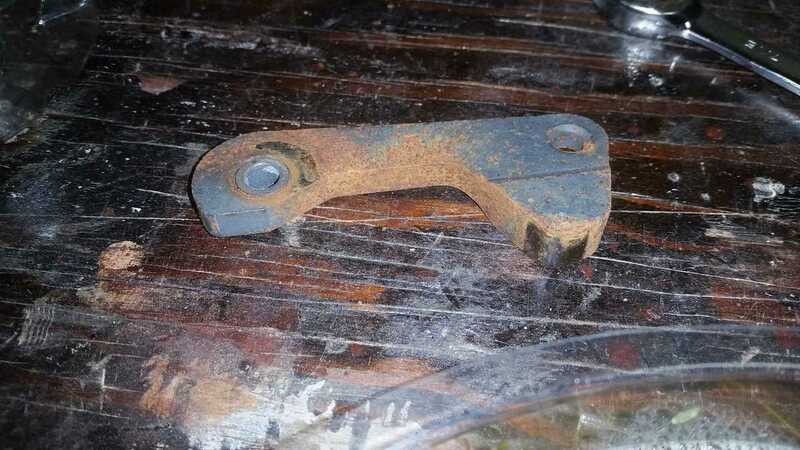 A rusted brake rotor and C-clamp were treated in EVAPO-RUST for about 2 hours. 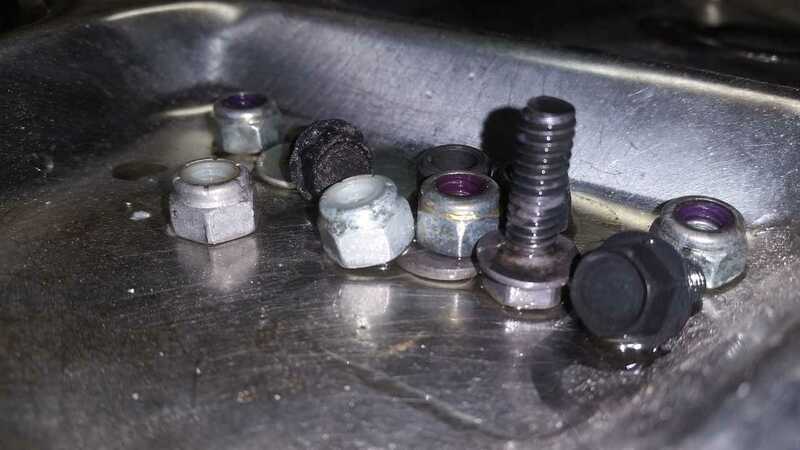 This spring and several other parts were taken off a snowblower in Wisconsin. Most pieces looked like they needed to be scrapped. 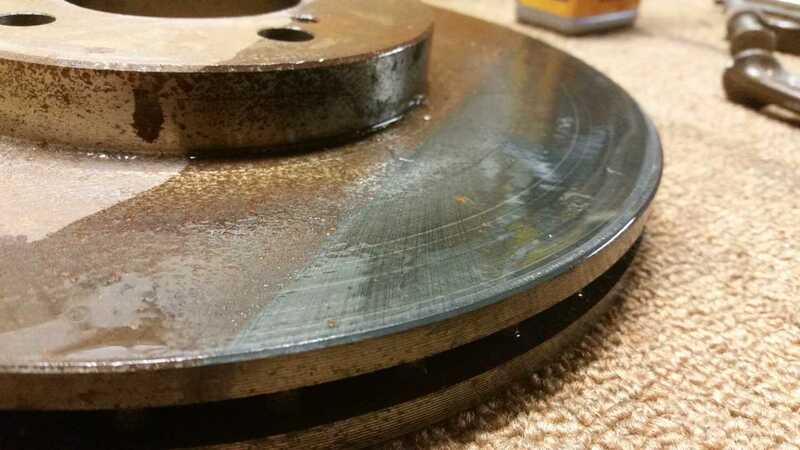 Rotor and clamp were dipped in water after removing from EVAPO-RUST. No other cleaning performed. Nearly all of them came back to life--the blackish film on the surface is from the dirty EVAPO-RUST solution. 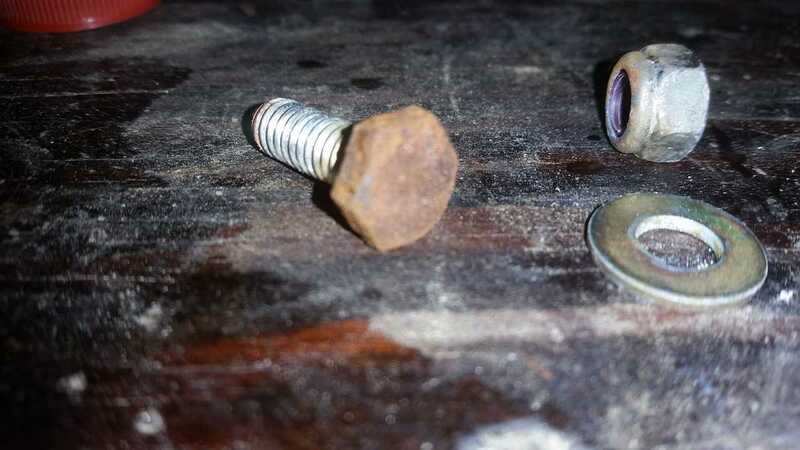 It will act as a rust inhibitor. For parts that need to be painted, this film needs to be removed.